The UK's first motorway, the M6 Preston Bypass, opened on this day in 1958, so today marks the sixtieth birthday of the motorway network. When it opened, it wasn't much of a motorway by modern standards. Just eight miles in length, beginning at a roundabout on the A6 south of Preston and ending at another roundabout on the A6 to the north, and with just one motorway-type junction in between them connecting to the A59 at Samlesbury, it had two lanes each way, no hard shoulders and a picturesque hedge down the central reservation. Lancashire Police reported that, in the first few weeks after "Motorway Six" opened, average traffic speed was about 40mph. The new road was opened by Harold Macmillan, then the prime minister, on the morning of 5 December, beginning the gradual completion of a motorway network linking the UK's major cities. It marked the start of a world Macmillan could scarcely have imagined: a world of fast communications by road, a world of new opportunities for business and industry, and a world of Motorway Cops narrated by Jamie Theakston. Ten years ago today, being the true road geek I am, I was in Preston with a group of like-minded people from SABRE, the official society for the sort of person who visits a motorway on its birthday. We travelled the bypass in all directions, photographed it from all angles, visited a special exhibition about it at the local museum, and made an excursion up to Cumbria to see the new section of M6 between Carlisle and Gretna. There was even a birthday cake. On the fiftieth anniversary of the first motorway, there were all sorts of other things happening too: TV programmes, radio documentaries, nostalgic newspaper articles. Here on Roads.org.uk (then, of course, still called CBRD) we published a biography of Sir James Drake, the man behind the bypass, and a long-form article on the history of the Preston Bypass. It's still online and still well worth a read. The sixtieth anniversary is not such a major affair. But we do have one interesting thing to share, and that's some pictures of one entirely forgotten bridge south-east of Preston that deserves to be much better remembered. When the bypass was built, you see, it was a two-lane road with some extra space in the central reservation in case it needed to be widened later, and it had no hard shoulders, just a strip of rough stony material alongside the left-hand lane. The bridges that went over the motorway were built to match, with a gap under each span for the extra space in the central reservation, but no space for a hard shoulder. Years later, when the road was widened in the early 1990s to provide four lanes each way, it was effectively rebuilt from the ground up, in places not even on the original line of the motorway, and with reconfigured interchanges. All the bridges over and under the motorway were rebuilt. Today you'd be hard pressed to find anything on, around or under the M6 Preston Bypass that was actually there 60 years ago when Harold Macmillan took his first ride on it. What's often forgotten is that the widening scheme in the early 90s only went as far south as the M61 interchange. South of there - between junctions 29 and 30 - the Bypass is still three lanes wide, on its original formation, with a third lane and a hard shoulder that were tacked on during the 1960s. Just one bridge crosses that length of bypass, carrying Brindle Road between Bamber Bridge and Walton Summit, and it is the only surviving overbridge from 1958. It's a fairly tired looking thing now, but it's still there, and today it's quietly celebrating its sixtieth birthday. So, to celebrate the anniversary of one of the few bits of this important road that truly have reached 60, here are some pictures of Brindle Road Bridge that were taken ten years ago today when it turned 50. Brindle Road Bridge is the same unappealing colour as all concrete that's spent 60 years outdoors in northern England, but its unassuming appearance hides its interesting place in history. Down below, the supports are horizontal beams balanced on pairs of chunky concrete legs - the same design as all the other original overbridges, all now gone. Underneath, there's no hard shoulder through the bridge, because the bridge was never designed to accommodate one. And up above... oh dear, it's those road enthusiast types again. Don't they have anything better to do? As well as celebrating the sixtieth birthday of motorways in general and the Preston Bypass in particular, today we're raising a glass to Brindle Road Bridge, a barely-noticed flyover in Lancashire that can stake a pretty good claim to being one of the oldest things on the motorway network, and is without a doubt the single most visible surviving relic of the very first motorway. Anybody who shares a birthday with the M6 will turn 60 today and will in all likelihood be planning their retirement, but it's unlikely the M6 will be allowed to go home and spend a bit more time on the garden. With a bit of luck it will still be there and doing its job in another 60 years. So, next time you're around Preston, spare it a thought - and look out for the unassuming bridge where the hard shoulder won't fit through. The very first motorway was eight miles of relief for the Lancashire town of Preston. It goes without saying that there's an interesting story to be told about it. I’d always thought that there was nothing left of the original road, so to find that this one bridge is still there is quite heartwarming. I’ve not been further north on the M6 than Junction 19, but the Preston bypass is one thing I do want to tick off some day on my Road Bucket List! D'Urton Lane underpass near M55 J1 has original 1958 structures. (I think!) Can be seen from underneath. The inner two concrete bridge supports were the original Preston Bypass carriageway. The outer two bridge supports and bridge decks were added onto the side of the original road when it was all widened. 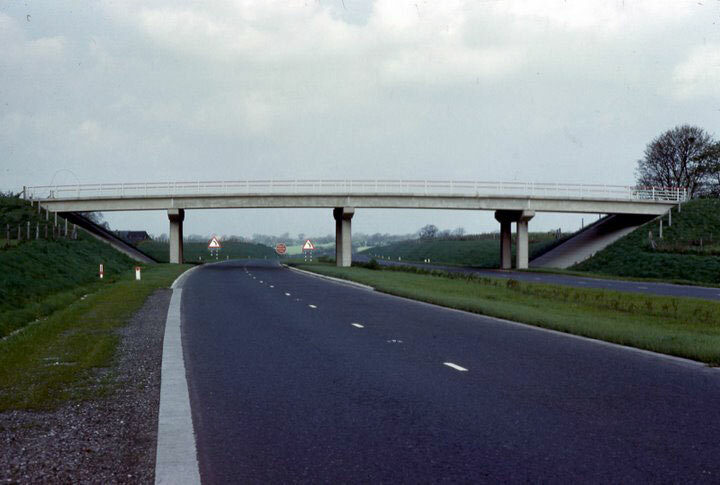 These outer bridges now form the slip roads connecting M55 J1. But I believe the original 60 year old structures are still there in the middle. Of course, this is now called the M55 so no longer has its original number. That's very true, and there's a couple of other underpasses hidden away where parts are original to the bypass, along with some elements of the road bed and earthworks. Which is why I worded the bit about Brindle Road Bridge very carefully! But it's certainly the most visible and recognisably unchanged feature remaining from the original road. Oops - yes, of course. Now corrected. Thank you! The only other bridge between 29 and 30 is Withy Grove Railway over the Blackburn to Preston railway. Lancashire County Council working on behalf of Highways Agency upgraded the parapets on this railway bridge. So until 1999 this was the only original underbridge. The work involved removing the original masonry parapets, adding 3 new beams to each side, providing a hardshoulder and upgrade to the parapet. The widening to the structure is not integral with the original bridge. It has separate piled foundations and a longitudinal joint in the deck. Somewhere I have photos of the work as it took place. Photograph of Broughton Lane Bridge is courtesy of the Motorway Archive Trust. A gallery of images sent in by visitors to the site of original photos of motorways — including some impressive views of the M4 and M11 under construction.